Atlanta has had a turbulent and fascinating history. Located in the state of Georgia among the foothills of the Appalachian mountains, and built at the intersection of two railway lines in 1837, it grew steadily in size until the Civil War, when after a four-month long siege the city surrendered and was burnt to the ground. 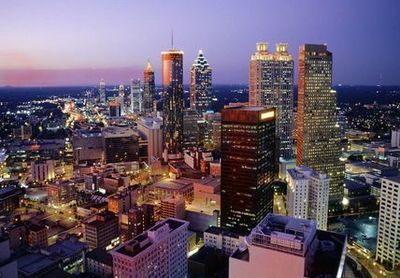 The city was gradually rebuilt, and from the beginning of the 20th century to the 1930s the population tripled in size, and the first skyscrapers appeared to grace Atlanta’s skyline. The classic film “Gone With the Wind” was premiered in Atlanta, and the city can lay proud claim to being one of the organising centres of the Civil Rights movement during the 1960s. In 1996 it hosted the Centennial Olympic Games, leading to major investment in sporting and leisure facilities in the city. Atlanta is divided into a series of districts, each with its distinct personality and architecture. There are three major high-rise districts, Downtown, Midtwon and Buckhead, which are surrounded by low-rise neighbourhoods, and on the west side of the city former warehouses have been converted into housing and art galleries. A car is essential for getting around during your stay in the city, and the easiest way to arrange car rental in Atlanta is to find the vehicle and price deal to suit you with GoCarRental.com ahead of your visit. As the home of the world’s favourite drink, the World of Coca-Cola merits a visit, and you can taste over 60 different products from around the globe, as well as learning the full story of Coca Cola. Georgia Aquarium has a wonderful display of “sea monsters”, and regular exhibitions where you can learn more about sea life and endangered species. The Fox Theatre is a magnificently restored 1920s cinema, featuring “Mighty Mo”, a classic Moller organ with 3,600 pipes. The Martin Luther King National Historic Site takes in the birthplace of the leader of the Civil Rights movement, the church where he preached, and the memorial site where he’s buried. The Swan House is a beautifully restored and elegant mansion built in the 1920s for a cotton magnate, and a tour of the house and grounds will give a glimpse into a different era in the life of the city. A rare occasion when you should leave the car behind and explore on foot is a visit to Buckhead, one of the most affluent districts in Atlanta, with its high fashion boutiques, multi-million pound mansions, art galleries and restaurants. If you are collecting your car rental from Atlanta International Airport on arrival, look for signs to the shuttle service which links the airport to the Rental Car Center. You will certainly need to use a satnav to guide you around Atlanta’s urban sprawl, and to allow you to concentrate on unfamiliar signage and driving on the right! To get to downtown Atlanta from the Rental Car Center, a 10 mile drive, take the Interstate 85-N and you will join the Downtown Connector after 7 miles, bringing you to Fulton Street, close to the Five Points where the city supposedly originated.